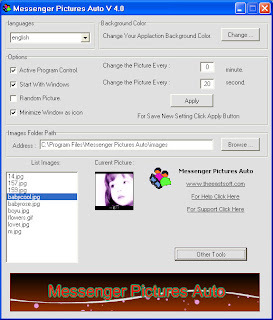 Messenger Pictures Auto allows you change your Windows Live Messenger display picture automatically. All you have to do is to choose the folder where your avatars stored. After that this program automatically set these pictures as your display picture at a given period of time. # Change display picture automatically. # Browse all avatars for your contacts and copy what you want to imagesfolder directly. # Browse all NickNames for your contacts and copy what you want to clipboard. # It's free and available in many languages.